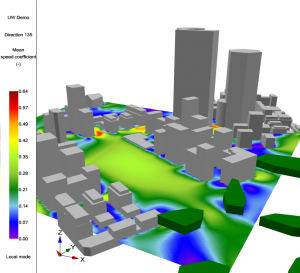 Urban wind computation based on CFD can be used by architects, urban planners and green building consultants who need to assess the wind in urban areas. CFD technology namely computation of the wind flow remains a solution for non-specialist. UrbaWind software is automatic and parameterized to provide the useful information to design. Available results are helpful to assess the outdoor pedestrian wind comfort of urban area, the small wind energy production and the natural ventilation of green buildings. 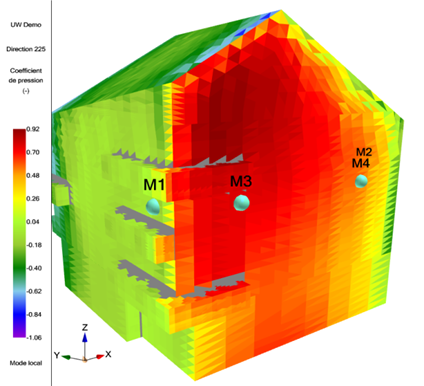 Some Dynamic Thermal Simulation Modellings (Design Builder, Virtual Environment) need as input the air change rate to assess the indoor energy balance for naturally ventilated buildings. The pressure coefficient values on outside wall are used to compute the mass flow rate throw the openings. Unfortunately, these coefficients are given in these software with database only for simple and detached buildings. For others configurations namely all the configurations included complex buildings in urban area, these values are wrong. Energy + weather files (EPW) are common as input to introduce climatology in building design. Up to now, UrbaWind read weather frequency tables and wind times series. The new version 2.2 allows a connexion with energy + database delivered by the US department of energy available with numerous software as Meteonorm. 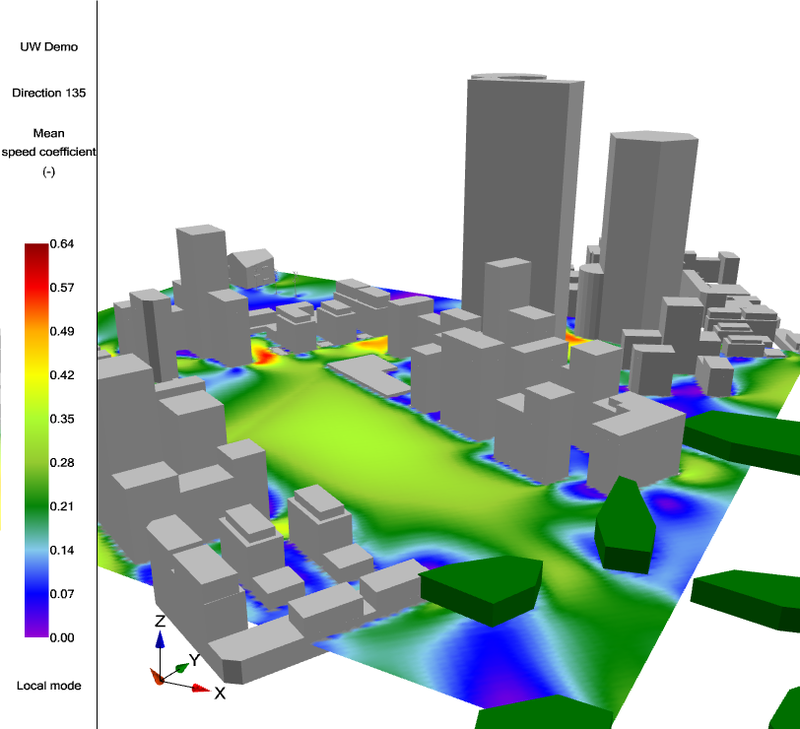 Without a CFD wind computation tool, unfortunately, designers made some hypothesis to assess wind flow in urban area and the pressure on buildings wall. UrbaWind enables to compute enough precisely and quickly the wind, even in complex large urban area, and gives better conditions for others software. It raises any doubts on the parameters from the knowledge of the wind. Users can now export easily for each openings pressure coefficient tables in the format of the Dynamic Thermal Simulation software. The wind incidence are given both according to the meteorological frame and to the opening frame as in Energy + software. The software introduces effects of porous vegetation on the wind (trees, hedges) in order to assess the comfort of pedestrian in outdoor spaces. But now differences are considered when the wind is computed according to the size of the porous volumes. SWIP PROJECT – How to develop use of small & medium size wind turbines in urban and peri-urban areas? 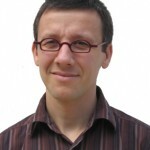 Product manager "Building and city planning" and natural ventilation expert at Meteodyn. PhD in Aerodynamics and thermics, I'm specialized in applied research in wind effects in urban area : pedestrian wind comfort, wind load on buildings and natural air ventilation. Why we need to assess the pressure coefficient field on the building envelope ? Why we need to compute all the directions of the wind to compute the pedestrian comfort ? How numerical solutions provide valuable results for building engineering ?